We have arrived in a very pleasant harbour at San Leone so that we can catch a bus to see the temples at Agrigento, having spent the last few days in Northern Sicily. 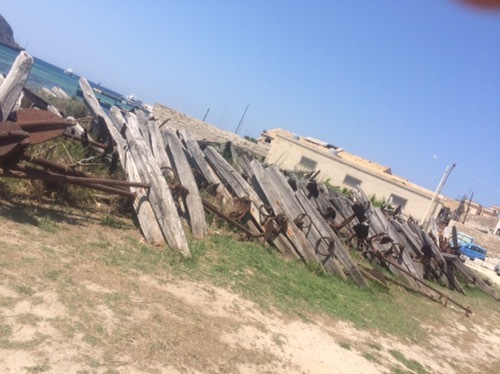 On Saturday, we took our fold up bikes to shore and cycled round most of Favignana to see the main town and visit the tuna museum. Tuna fishing was big business here until fairly recently. A tuna factory was set up in the 19th century to cover the whole process from catching the fish to putting the meat in tins. 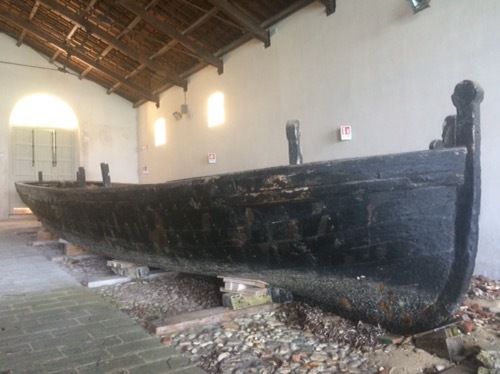 The boats they used were huge and were rowed into place with large nets dropped to the sea bed and held by anchors. The tuna were then speared and dragged into the boats. It looked like back breaking work. Once back on shore, the fish was gutted, cleaned, cooked and then tinned all on site. 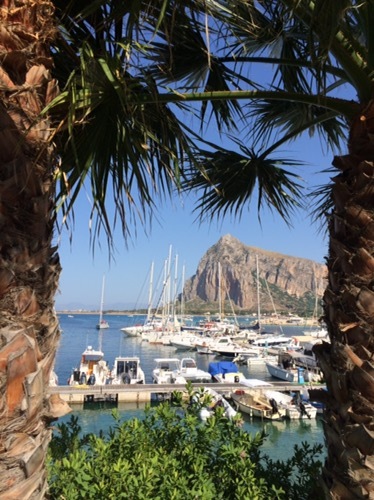 We set off on Sunday morning north, towards San Vito lo Capo at the top of Sicily as it was supposed to be quite quaint. We were going to stop over at Levanzo, one of the sister islands to Favignana but we didn’t like the look of it when we got there so we just kept going. About 2 hours in, the Italian customs decided to pay us a visit. They didn’t recognise our blue ensign and had no idea where Plymouth (Nimrod’s home port) was. Eventually we cleared things up without them having to board us but that didn’t stop Liz taking a photo! We arrived at San Vito around 4pm and managed to secure one of the few remaining visitors’ berths. It is a sweet little tourist town with a lovely beach and all the amenities you could wish for so we bought provisions and a new refill for the gas bottle. It felt a bit like Gibraltar with the imposing cape in the background but with a lot more style! We decided to eat out and went to one of the recommendations from the marina manager. No doubt a friend of his but the food was delicious and it was away from the main tourist drag. On Monday morning, the plan was to leave after breakfast and go down to a small village called Scopello, which is supposed to be a bit like Deia on Mallorca. We also needed fuel but the fuel berth was occupied the evening before so thought we would get it in the morning when all of the pleasure day boats had left. Just as we were leaving our berth a squall came through from the east and the wind went from 4 to 25 knots in about three minutes. This was not forecast at all! We thought we might be storm bound for another day, which at €50 a night could have been a tad expensive! As it happened, about an hour later, all became calm again so we refuelled and set off to Scopello via the Zingaro National Park. Scopello didn’t disappoint although it was blowing a hooley all the way there. I think from the katabatic effect of the wind funnelling down the mountains. 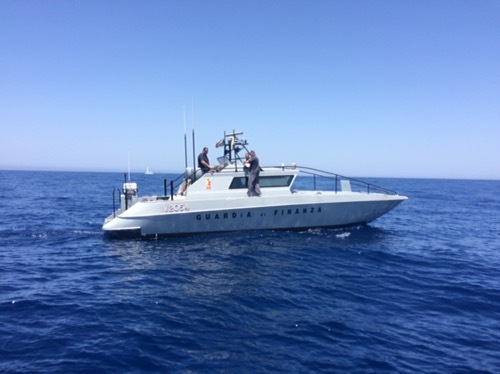 We had high winds coming back up the coast towards San Vito so had a great sail but then the wind direction changed at the Cape and it was once again on the nose so we motored back to Favignana and picked up another (free) mooring buoy. 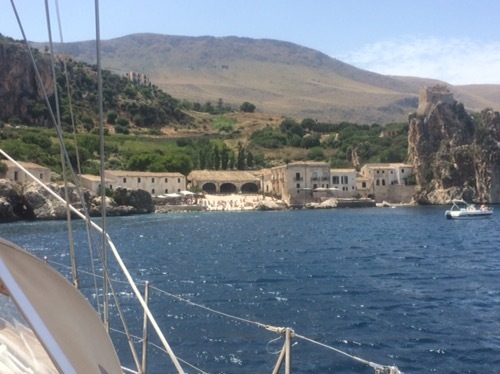 The forecast was for gale force winds along the south of Sicily so we thought we would wait for the worse to be over in our sheltered bay then catch the last of it to sail down towards Agrigento on the south coast of Sicily. As we had nothing planned for the Tuesday apart from an early evening departure, we decided to treat ourselves to lunch in a converted quarry that was now an hotel. Lovely food and an interesting setting. We left our mooring at 9pm as it would take between 12 and 14 hours and we wanted to arrive in the morning so we could spend the day in Agrigento. Again, the forecast was wrong as there was virtually no wind and what little there was came from behind so you need that bit more to push you along. We motored the whole way so just as well we had filled up in San Vito! This entry was posted in News and tagged Italy, Med, Sicily. Bookmark the permalink.